Focused on improving math and reading skills, Funbrain features books and comics as well as arcades filled with interactive games. This site combines reference materials, facts, and trivia quizzes for kids on all subjects. Parents, educators, and kids can get homework help and access almanacs, an encyclopedia, a dictionary, and an atlas. 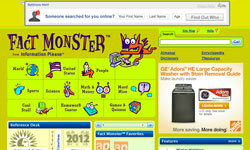 Great Websites for Kids is a compilation of exemplary websites. Suggested sites are evaluated by the Great Websites for Kids Committee using established selection criteria. The committee is made up of members of the Association for Library Service to Children, a division of the American Library Association.